Diagram showing datalink to Earth. 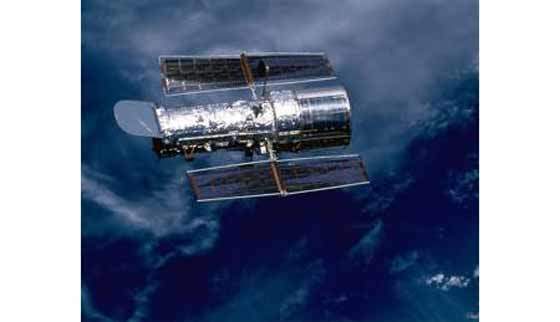 The Hubble Space Telescope (HST) was launched into orbit around Earth on 25 April 2001. 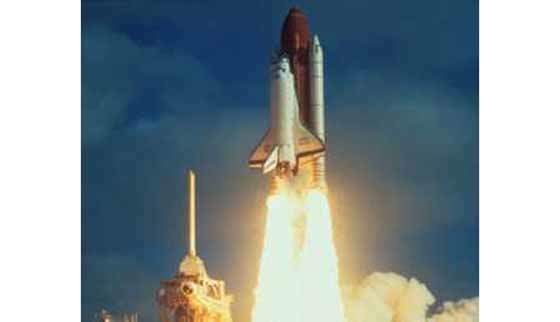 Launching Hubble via the space shuttle. An astronaut during the satellite's three servicing visits. The telescope, showing its solar panels. Hubble Space Telescope (HST) was launched into orbit around Earth on 25 April 1990. HST is an observatory, originally conceived in the 1940s and finally made operational in the 1990s. 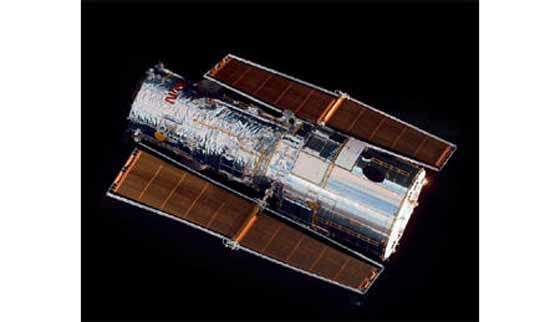 Hubble celebrated its 20th anniversary in orbit on 24 April 2010. The HST is a co-operative programme of the European Space Agency (ESA) and the National Aeronautics and Space Administration (Nasa). The aim of the observatory is to operate a long-lived space-based observatory for the benefit of the international astronomical community. HST is a 2.4m reflecting telescope which was launched into a low-Earth orbit (600km) by the crew of the space shuttle Discovery (STS-31) in 1990. The science operations and control of the telescope lie in the hands of the Space Telescope Science Institute (STScI) at the Johns Hopkins University Homewood Campus in Baltimore, Maryland. STScI is operated for Nasa by the Association of Universities for Research in Astronomy (AURA). The observatory was originally designed to have a lifespan of 15 years. Nasa, however, conducted five space shuttle servicing missions on the HST for extending its operational life. The final Service Mission 4 (SM4), flown in May 2009, installed two new scientific instruments and repaired two failed instruments. The telescope was attached with a new device to help de-orbiting when it is decommissioned. The mission also involved several upgrades to extend Hubble’s service life until 2014. "The HST is a co-operative programme of the European Space Agency (ESA) and the National Aeronautics and Space Administration (Nasa)." HST works much like a robot or computer in space, performing tasks only in response to detailed instructions from people on the ground. The telescope has communications antennae so that astronomers and technicians can transmit instructions. Four antennae send and receive information between the telescope and the Space Telescope Operations Control Centre at Nasa’s Goddard Space Flight Centre, using the Tracking and Data Relay Satellite (TDRS) system. There are currently five TDRS satellites located at various locations in the sky. HST incorporates three cameras, two spectrographs and fine guidance sensors (primarily used for astrometric observations). Due to its location above the hazy atmosphere of Earth, these science instruments can produce high resolution images of astronomical objects. Ground-based telescopes seldom provide resolution better than 1.0 arc-seconds, HST’s resolution is about ten times better, or 0.1 arc-seconds. Originally the telescope functioned on a Wide Field / Planetary Camera 1 (WF/PC1). However, an early malfunction on one of its mirrors meant the images received were blurry. In 1993 the STS-61 shuttle mission, which was the first servicing mission for the telescope, saw the implementation of WF/PC2, a spare instrument developed in 1985 by the Jet Propulsion Laboratory in Pasadena, California. From this moment on HST sent back images of the highest quality. WF/PC2 is actually four cameras, consisting of an L-shaped trio of wide-field sensors and a smaller, high resolution (‘planetary’) camera tucked in the square’s remaining corner. WF/PC2 was replaced with a new Wide Field Camera 3 (WFC3) during Service Mission 4. Four postage stamp-sized pieces of high-tech circuitry called Charge-Coupled Devices (CCDs) collect information from stars and galaxies to make photographs. CCDs are electronic circuits composed of light-sensitive picture elements (pixels). Each pixel is given a number and then transmitted to ground computers on Earth to form an image. Hubble’s Space Telescope Imaging Spectrograph (STIS) enables the telescope to separate the light entering the camera in order to analyse properties such as temperature, radial velocity, rotational velocity and magnetic fields, across a spectral range from the UV (115nm) through the visible red and the near-IR (1000nm). It is capable of performing two-dimensional rather than one-dimensional spectroscopy, therefore allowing analysis of many locations in the galaxy simultaneously. It can also record a broader span of wavelengths in the spectrum of a star at one time. STIS went out of service in 2004 due to an electronics failure. It was repaired during SM4 to complement the newly installed Cosmic Origins Spectrograph (COS). 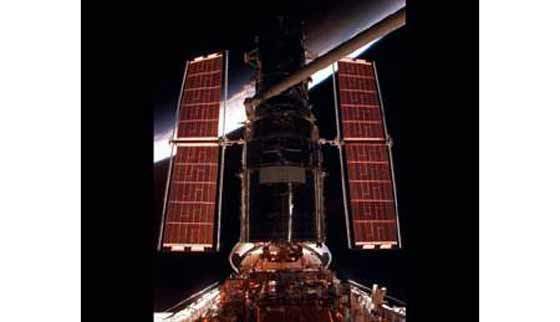 The Near Infrared Camera and Multi-Object Spectrometer (NICMOS) is an HST instrument providing the capability for infrared imaging and spectroscopic observations of astronomical targets. Nicmos works only at very cold temperatures and uses cryogenic technology to keep the detectors cold. The faint object camera (FOC), built by the European Space Agency, uses image intensifiers to produce images, which are 100,000 times brighter than the light received. These images are then scanned by an electron-bombarded silicon (EBS) television camera. The FOC provides an ultra sensitive means of analysis. 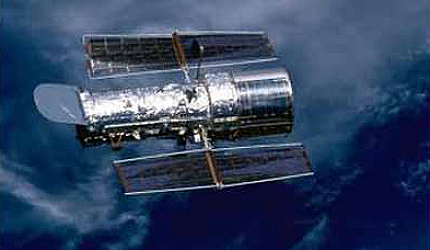 Designers of the Hubble Space Telescope were careful to take into account operating conditions. "HST is a 2.4m reflecting telescope which was launched into a low-Earth orbit (600km) by the crew of the space shuttle Discovery (STS-31) in 1990." Hubble would be subject to the rigors of zero gravity and temperature extremes, which includes fluctuations of more than 100°F during each orbit as the Earth blocks out the Sun’s light. To accommodate for this, a ‘skin’, or blanket, of multilayered insulation (MLI), which protects the telescope from temperature extremes was installed. Beneath this lies a lightweight aluminium shell, which houses its optical system and science instruments. The telescope’s optical system is held together by a truss (skeleton). This was specifically made of graphite epoxy (used for tennis racquets / golf clubs), due to the material being stiff, strong and lightweight and, resists expanding and contracting in extremes of temperature.